Scenic steppes, nomadic tribes, and fascinating traditions await those adventurous enough to travel through the vast and unforgettable country of Mongolia. This lesser-known tourist destination is one of the best places to get away for the overly trodden tourist trail and discover a land full of untouched landscapes, vibrant cities, and wandering tribes. Since Mongolia is not a popular tourist hotspot, it is best to be prepared before visiting the country. Here are ten things you should know before traveling to Mongolia. Whether you are wandering through the steppes, heading through a mountain pass, or venturing into the desert, the best way to see the country is by hopping in the car and starting the road trip of a lifetime. There are two ways to do this. The first, you can hire a driver to show you around the country. This is the easiest option, although not quite as adventurous. If you are looking for something a little more challenging, then rent a car and do it yourself. Just make sure you are prepared for such a journey. A lot of the country does not have paved roads, GPS, road signs, markers, or maps. This gives the trip an epic sense of adventure, traversing the lonely plains as you figure out the best way to get from A to B. Either way, a road trip around Mongolia is unforgettable. Another useful tip to prepare you before embarking on your Mongolia road trip is to make sure to carry extra gas, tires, and have proper insurance. Whether you will need them or not, these helpful lifelines will give you peace of mind throughout your travels. Also bear in mind the harsh conditions of the landscape when renting a car or picking a driver. The Mongolian terrain can be tough, so a 4X4 is your best bet to take you across the country. Mongolia is one of the few remaining countries in the world that still have tribes of nomads, wandering from place to place with their herds. Whether you are traveling the country by bus or car, you are bound to run into them at some point. Let down your guard, do not be shy, and take the time to get to know them. The nomadic people love travelers, and it is easy to talk to them and make friends. They are lovely people who will invite you to a home-cooked meal and even let you spend the night in their Ger, a white cloth nomadic tent. You will have an unforgettable time. Another tip: Upon leaving, it is polite to donate to the family for the food and shelter. 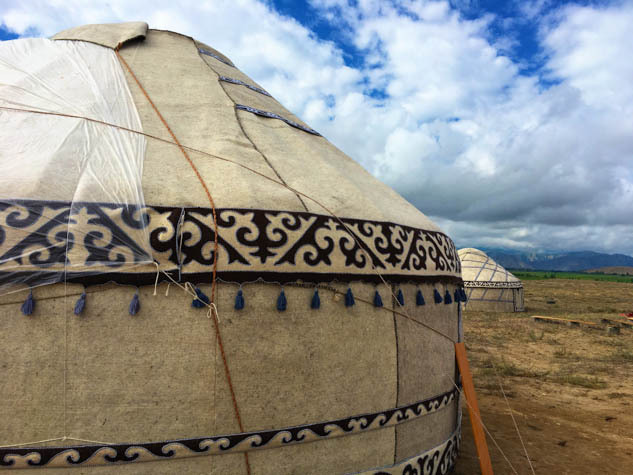 There are a few cultural traditions that you should follow in Mongolia when staying in a Ger. The rules are few but are important and you should honor them completely when camping with nomads. Make sure to never lean on the walls of the Ger. Never point your finger in front of you while sitting. Never touch a Mongolian on the head. Always accept food or drink that is offered. And always use your right hand when receiving or giving anything. Mongolia does not have any mountains, large hills, or even trees. The landscape is full of plains and small hills. While this is strikingly beautiful, it also means there is nothing to cut the wind. If you are camping in Mongolia, the night can be cold and windy. It is essential to make sure you have proper clothes, a high-grade sleeping bag, and a tent that can hold up to the weather. Members of twenty-two different countries are granted visas on arrival when landing in Mongolia. The visa is free and can last from 30 to 90 days depending on your citizenship. US citizens are granted a 90-day visa. Mongolian festivals are extravagant, fun, and exhilarating. Many of these festivals still highlight the old traditional games, wrestling, and of course horse riding. A few of the most popular festivals in Mongolia are the Camel Festival in March, the Golden Eagle Festival in October, and the Naadam Festival in the summer. Plus, the festivals are not only fun but is also the best way to learn about Mongolian heritage and traditions. Mongolia is known for local foods such as rice noodles, goat curds, and airag, a local alcohol made from fermented milk. It is not the best drink I have ever had, but trying it is necessary when traveling across the country. I am a big fan of exploring Mongolia with simply a map in hand. However, if you are even a little nervous about this prospect, there are plenty of tour companies and guides that will show you around the country. This is an excellent option to calm your nerves, let you relax, and see the country stress free. There are many tour options ranging from a few days to a month and most of them are relatively inexpensive. Mongolia might not be the easiest country in the world to travel around, but it is the perfect land for adventures and thrill seekers. The people are friendly, the food is tasty, and the landscape is beautiful, however, the challenge of the country is the work it takes to get from one place to the next. Don't sweat it too much; for those willing to do the work, the rewards are an experience of a lifetime. Many travelers are nervous about traveling across the open, exotic plains of Mongolia. The truth is that the scenic country of nomads and horse lards is beautiful and charming. It is a land where the culture and the people stick with you long after returning home. If you want a memorable adventure, then make plans to venture to Mongolia at least once in your life.